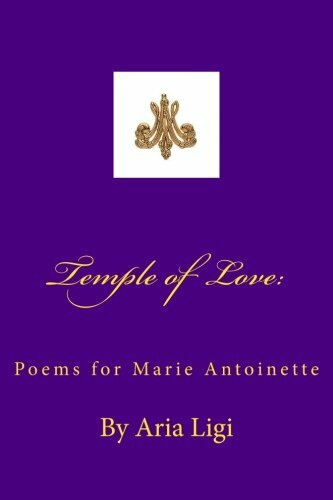 about this book: While I was writing my first book of poetry, "Blood, Bone and Stone", there was one section in it, which were poems for Marie Antoinette. As I was writing, the section grew from a few poems, to a book unto itself. This was due to not only writing poetry for her, but doing a lot of research on Marie Antoinette. I delved into her life, those around her, the memoirs of the Princess De Lambelle, and the letters Marie Antoinette wrote between herself and her mother. The material was voluminous. It was my hope that in reading about her, (and especially her letters) I would be able to capture not only her essence but, her voice and spirit as well. The title, "Temple of Love", is taken from one of the buildings she designed at her home the Petit Trianon called: Temple of Love. This is where she felt most at peace, and in addition, it is indicative of her style and how she influenced art, design and architecture. She is not credited through history as having an impact on architecture and design, yet, she did, and one can see it in looking at her homes, and how they were constructed. She was an intricate part of this, and had an eye for how things should look that has influenced fashion, architecture and building design event to modern times. The cover of the book, has her glyph on it, with the letters in a script which is at once and elegant and easy to read. The background purple signifies royalty. My intent was to make the cover simple beautiful, and distinct and in doing so, state unequivocally that this was for Marie Antoinette. It was my hope that if she were to pick up this book, she would understand this and appreciate not only the cover, but the content as well. In writing this book and doing the research I felt like I was continually learning not only about Marie Antoinette, but about the French Revolution, French and English eighteenth century vocabulary, the politics of the time, and how people lived, and comported themselves. I was also able to see clear connections between our time period and then, and how things that are happening at this time, have a clear corollary. To those reading this book, I hope that they get a clear sense of the time period, and who Marie Antoinette was not merely as a Queen, but as woman, mother and human being.